In gathering, head of Vizhnitzer dynasty calls upon followers to give up cell phones - even Kosher ones - and speak in Yiddish. The Rebbe of Vizhnitz called upon his followers to speak in Yiddish whenever possible, and eschew the use of other languages. 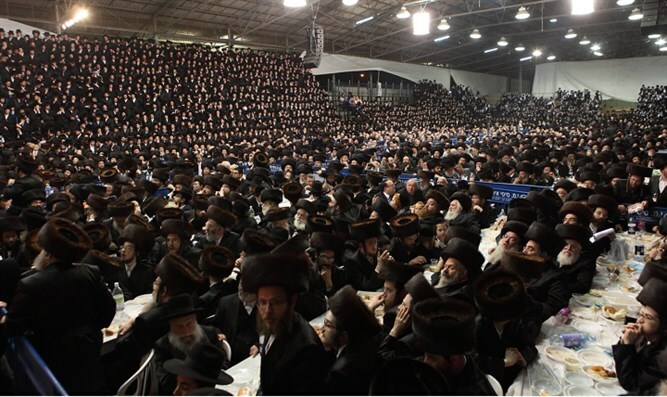 Speaking at a gathering of Vizhnitz hasidim Monday evening, the Rebbe noted that while use of Yiddish is common in hasidic households both in Israel and America, it nevertheless “needs to be strengthened,” urging followers to speak only in Yiddish while talking with family members and other hasidim. The revered Rebbe, who heads the large Hungarian hasidic dynasty, also criticized the use of cellular devices, calling them a waste of time. He noted that his comments related to approved “Kosher” phones and not unfiltered, “non-Kosher” devices.